In 21 starts, the left-hander is 7-8 this season but owns a respectable 3.63 ERA. Saunders has been especially impressive throughout the month of July. He’s notched a 2.12 ERA in 34 innings of work. During that span, Saunders is 3-1, while opponents are hitting just .207 against him. 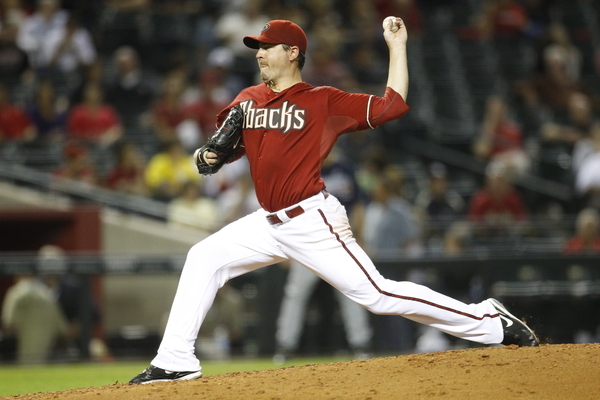 The veteran of the starting rotation was acquired by the D-backs last July from the Angels. Throughout his six seasons in Los Angeles, Saunders was one of the most reliable starters in all of the American League. He won 54 games for the Halos and was an American League All-Star in 2008. That success and reliability has followed him to the desert. Saunders was back at it once again in Tuesday night’s series opener against the Padres at Petco Park. His 21st start of the 2011 campaign turned out to be one of his most memorable. Efficient from the start with his pitch count, he unleashed a dominating complete game victory, scattering six hits and shutting out San Diego for the first 8 2/3 innings of the game. By receiving several first and second pitchouts in the early innings, the lefty was able to finish what he started. With two outs in the bottom of the ninth, Jesus Guzman broke the shutout with a solo home run to centerfield. Saunders recovered quickly by retiring Chris Denorfia on a game-ending flyout to left field. Gibson also noted that Saunders’ efforts to improve his pitch efficiency are paying dividends. Saunders was particularly effective with his pitch count, and consistently threw strikes all night. The D-backs’ hurler needed just 99 pitches to seal the sixth complete-game performance of Saunders’ seven-year career.